The coronation of Her Majesty Queen Elizabeth II in June 1953 involved a lot of preparation for St George’s Chapel, despite the fact that it would take place in Westminster Abbey. The lay clerks and choristers were to form part of a nearly 400-strong choir, made up of members of the choirs of Westminster Abbey; the Chapels Royal of St James’ Palace, Hampton Court and the Tower of London; St George’s Chapel; St Paul’s Cathedral; the Queen’s Chapel of the Savoy; and members of 15 other cathedral and church choirs including those from St Patrick’s Cathedral, Dublin, and St Mary’s Cathedral, Edinburgh. Still more came from the dominions. 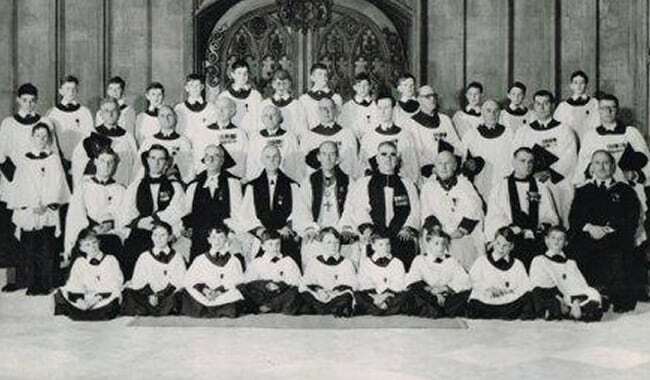 22 choristers and 10 lay clerks from St George’s Chapel, together with the organists William Henry Harris and Lionel Dakers, and the Minor Canons Christopher Hare and W.A. Pike, performed at what would surely be one of the greatest occasions of their careers. Each would receive a Coronation medal, along with other members of the College, as a memento of the event, and as a further commemoration, the choristers chose to put their expenses towards a new garden-seat for the playing fields. A further part was played by the Dean, Bishop Eric Hamilton, who walked in the procession in his office as Register of the Order of the Garter, wearing his officer’s robes and carrying the Register before him. Held in the Chapter Library in a volume of religious tracts is one entitled The forme and order of the coronation of Charles the Second… by Sir James Balfour [SGC RBK B.33]. 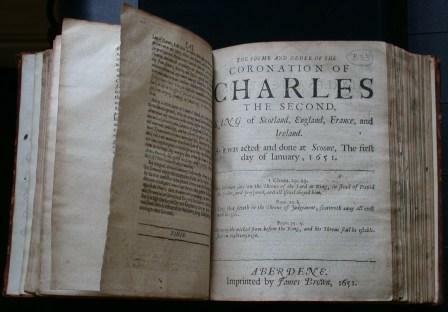 It was published in 1651, and records the coronation of Charles by the Scots at the Palace of Scone, the traditional crowning place of the Kings of Scotland, on 1st January 1651. Scone had been the resting place of the Stone of Destiny, which legend said was the stone used at the crowning of Fergus Mór, the founder of Scotland. It was used for centuries in the Coronation ceremony, until 1296, when Edward I took the Stone from the Palace as spoils of war. It was taken to Westminster Abbey where it was set into a wooden chair on which future Kings of England would be crowned. Although crowned King of Scotland in 1651, it was not until 1660 that Charles II would sit on the Stone of Destiny, but this time he would be crowned King of England. It is interesting to read in the tract that Charles swore his oath with the words “I Charles, King of Great Britain, France and Ireland…”, creating a union between Scotland and England decades before the formal union under Anne in 1707.